New Speakers = No Bass? Premium speaker installation, what is this you speak of? I got an email from an installer, sorry mobile electronic technician, stating he pulled off a door panel on a 2014 Chevrolet truck and someone had upgraded the factory speakers. Let’s break down a factory speaker: low wattage, usually a paper cone, factory Molex connection and a foam/rubber gasket between the speaker and panel. Back to the speaker upgrade, the speaker was an Alpine speaker (a good aftermarket speaker); it is mounted to a piece of ¼ MDF similar to the factory speaker design. The customer was stating, “After the speaker upgrade, I lost most of my bass”. 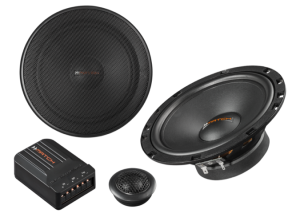 Let’s break down what happened, we upgraded to an aftermarket speaker, a 75 watt RMS speaker, the factory speaker is 15 watts…the factory head unit is roughly 15 watts. Here are my thoughts. We all agree the further a speaker moves in/out the more bass we have. If the factory speaker moves a ½ inch in/out with 15 watts, it has quite a bit of bass. If the aftermarket speaker needs to use 75 watts to move the same amount (1/2 inch), the aftermarket speaker is only moving roughly 1/8 of an inch! This equals less bass; this is a bit of a generalization but does cone material and tweeter composition contribute to bass performance at these wattages? Now that your head hurts from my dirty math, the factory gasket from the panel to the speaker baffle was also missing. The energy from the speaker is getting lost between the panel and the baffle. This results in cancellation and loss of bass. Our “speaker upgrade” resulted in a loss of bass from the wattage differences and getting a cancellation from the removal of the factory speaker gasket. The customer probably paid roughly $150 for speakers and $50 for labour and taxes. Let’s just call it $220.00, for less performance than his factory system. So one may say,” The customer only paid $220.00, what does he expect? “ If we cannot do a better job than a customer’s buddy or “expert friend”, why would they pay us more for doing a better job? Why would they buy the speaker locally? They could buy the speaker online or shop around locally and get their “buddy” to install it. Did we tell the customer we are going to make the speaker sound worse than the factory speaker? Let’s try explaining the steps on replacing the speaker to the customer and how we are going to make the vehicle sound better. These installation points are very valuable, we are mobile electronic technicians, and it is a disservice to the customer not to give them the experience they deserve. If the customer above had the same experience of losing bass after a speaker upgrade in your store, do you think he would be purchasing more products from you? Recommend you to others? Purchase any other 12-volt products in the future? Maybe if we try the explanation above for speaker installations and charge a small shop supply fee for replacing the speaker gaskets, replacing one use door clips and adding foam tape (one roll of ¾ inch foam tape is $7.99 at Home Depot) we can provide the customer with a true speaker upgrade. Once you have explained to the customer that $3.00 in foam tape and the above replacements can keep out road noise and ensure tight bass in their vehicle, I am sure the customer would have no issue paying the shop charge. Your experience and knowledge of speaker installation cannot be shopped on the Internet.